Have you ever been visited by wolf spirit either in real life, during meditation, or in your night dreams? Listed here are stories shared by our readers detailing their connections with wolf totem. ~I'm almost 50 and never in my life have I seen a live wolf, not even at the zoo. However, I have been fascinated by wolves since I could say "wolf" and have studied them more than casually for just as long. Well, last night at almost midnight, in the streets of Milwaukee, a beautiful gray wolf sauntered across the street in front of me into a semi truck parking lot. It was dark and no one was around but I slowed to about 5mph and this beauty actually slowed to a trot and turned to look directly at me. I couldn't believe my eyes. We locked gazes for what seemed like an eternity. I felt like this wolf had something to tell me and I was actually thinking of getting out of my car and approaching "her" but then a truck approached and she was gone. I'm still dumbstruck. I've been dealing with a tough matter this past year and I felt I was being told that my intuition is spot on and that the time has come for me to wake up and start being who I am supposed to be. I tell you what, it was AWESOME! ~I've had a very spiritual connection with wolves since I was very little. I went on a hike with my grandparents when I was only about 4 or 5 years old and got lost, eventually running into a pack of timber wolves who were immediately drawn to me. What I assume was the alpha female stopped in front of me and started licking me like she was cleaning off the dirt that I looked like I'd bathed in. Once my grandparents found out where I was the wolves left before my grandparents could see them. But ever since then I've seen a white wolf who has almost grown up with me from a puppy to the young adult I am today. She rarely talks to me but we have this almost psychic connection that allows me to understand what she is trying to tell me. She's helped me through some rough times but has helped me feel closer to the Earth, to the Spirit world and to my Cherokee heritage. My grandfather always told me that I had the wild but tamed spirit of the white, pure wolf and he was definitely right. ~I was living in this home for a few years. Lots of property and beautiful trees, bushes, etc. Every single time I took a picture outside, there would be perfect shadows or outlines of wolves in them. I had never experienced anything like it in my life. ~I'm sixteen, and I'm part Indian. I've always been told that my spirit guide is the wolf but I didn't believe it until tonight. I was riding the bus home from school and on the side of the road I saw a big white wolf with a black face, and it was just staring at me. I asked everyone around me if they'd seen it, and they all said no. About 10 minutes later, I saw it again, on the side of the road just sitting there staring at me, and again I asked people, and they replied with the same answer. I saw it one more time before I got into town, and it was on the side of the road howling, and no one had heard it but me. I heard it through the bus, and the music on the bus, it was a weird feeling. I wonder if it will come back. ~When I was young I would see a black lone wolf approach me every time I would sleep. It never growled or bared his teeth. But he always stayed out of my reach. I'm 18 now and I still see it. 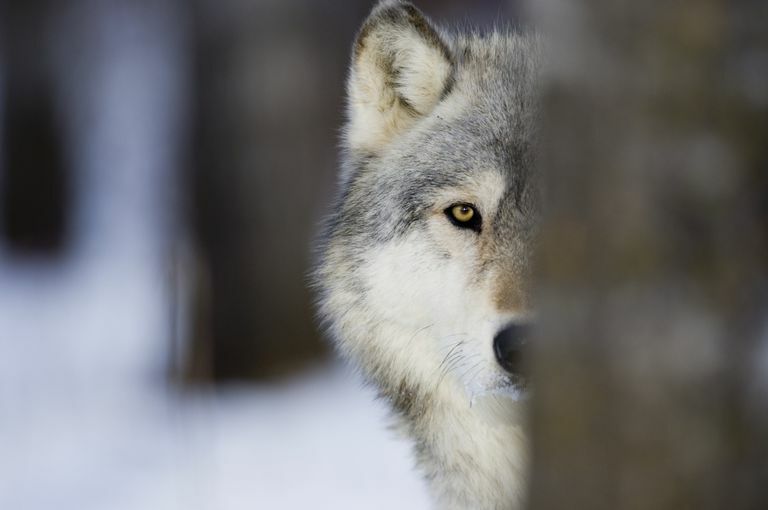 I have tried talking to the wolf but he would look up at me and slowly fade into the shadows. Just the other day I was walking in the woods by my house and I came across a black wolf. I froze, thinking he was gonna attack me, but instead, we locked eyes and I felt a connection to that wolf. ~A black wolf passed in front of me. I stopped and the wolf turned and stared into my eyes. It was magical. ~Ever since I was a child I've had a special connection with wolves. During an excursion with the Boy Scouts I camped off and away from everyone else, that night I was woken up by wolves making their way through our camp site. I did not get a look at all of them but I did have a very spiritual moment with what I can only assume was the pack alpha. He walked quite literally to the edge of my feet and just stood and stared at me. It seemed like a good amount of time we just stared at each other, completely understanding. I know looking a wolf in the eyes is a direct challenge but there was no challenge, growl, or anything from him. After a few years, my 'minor visions' became more rampant and widespread. I saw things such as natural disasters and events that caused a great loss of life. I still have these 'gifts.' I've found after some research that it runs in my family, these visions. I was happy that I found my spirit animal is, in fact, a wolf. ~I was about 4 years old. I was facing North towards the high bluff over the river, and if you were standing on the bluff in the fall, you would see the town of Chillicothe, Shawnee for "Big Town." Near the treeline, I saw a big, dark form. It looked like a wolf or a large dog that was shaped like a wolf. I felt no fear towards the animal and stared at it openly. It sensed that I was looking at it, and it ran towards me. It was supernaturally fast. To my disdain, its fur began to mottle white. I began to feel terror so extreme that I could not unroot my feet from the ground, or scream. It was about 100 ft away from me and it was all white, and its eyes were red and glowing like embers. I finally was able to run, and I took off on my small legs and climbed the trellis and got up on the top shelf of the smokehouse. It bit me on my left ankle but I didn't bleed. I screamed for my mom and she ran it off. It was black when she got there. I have a birthmark like a dog paw where it bit me. ~If it wasn't for the white and black wolf spirits I wouldn't be here today. I was walking downtown one day and had to wait for the crosswalk sign to change to cross the street. I would normally wait down on the corner, but something pulled me back from the corner because a car ran the red light which was also no turn on the red light corner. Had I been standing there I would have been hit by the car and possible be dead from it. If it was for them I would be walking with the sky people. Never be afraid of our animal spirits.They are there to help you in your life's journey and give you guidance. ~When I feel a spirit of some sort I get shivers. thus, I get shivers a lot. Sometimes they are evil sometimes they are not. When they are evil I call upon my wolf spirit guide, Moon and her daughter/pup Keelana (River in wolf languages). The point is, they offer me protection and I could not live without them. ~I am thirteen years old. I am young, yes, but my grandfather is part Cherokee and I wanted to get in touch with my native side. One day I started researching Spirit animals out of nowhere. I've always felt connected to wolves. So I tried to find my spirit animal. I went to my bed and laid down. I closed my eyes and suddenly I was sitting down in the snow, waiting. Soon through the thick snow I saw a wolf walking towards me. She was a beautiful grey and with white on her neck, She wore an earring with an eagle feather on it. She was stunning. I asked her "What is your name?" she replied "Kindra." I was shocked because I thought it was my imagination but I did not make up that name. I looked straight into her green eyes, and felt completely safe and comfortable. I told her I had to go and she looked almost "sad" she said goodbye. And we walked our separate ways. I opened my eyes and just felt like I was with someone I had never met and did a good job on a first impression. ~As far back as I can remember whenever something upsetting would happen or I needed to understand an event in my life a female wolf with her pups would appear in my dreams, usually in a field of yellow grass that when I was little was taller than me but now comes up to my waist. In more recent years I've seen visions of a female wolf, who is called Amorak, with her young outside of my dreams. Some nights when I'm in bed I feel and hear an Amorak animal jump onto my bed, where she lies down next to me for the night. ~I have always felt a connection to wolves for as long as I can remember. I actually remember howling when I was little but when my voice dropped during puberty, I lost the ability to howl like I use to. I have never actually felt the need to seek out my spirit guide before until recently. The first day I decided to find it, I dreamt that I was turned into a black wolf by an unknown elder and I had a pack with me. I was their alpha. It was one of the greatest feelings I've ever had. Then I awoke and continued my research. I then reached out to my spirit guide through meditation and he came to me almost immediately. He was a black wolf with stunning green eyes and I realized I had seen him before earlier in my life when I was reaching out and was doing stuff that could be considered dangerous. I thought it to be an omen but then I realized that he was only trying to protect me. Now I want to learn as much as I can from him but I can already see the impact he has on my life. ~I've always been acutely aware of my spirit guide and that he seemed to be male and spoke to me almost as my subconscious mind. Through meditation, I saw him not only in the human form in my dreams but as a blackish grayish wolf. I was hesitant and stubborn at first and didn't want to go with him. The wolf stared at me intently and I at him in my obstinence. The dream repeated itself another time but this time I trusted and followed the wolf leading me through a forest and showing me where to walk. I was led into a circle of wolves and it was a feeling of protection n familiarity not fear. I was also led on a rock an elevated rock, where I could see the forest and the clear night sky, my guide in human form stood there looking out as did a wolf blackish grey with white face and greenish grey eyes at my other side. it seemed we were looking out at something. I wish I knew what it meant. I felt like the wolf walked with me. ~I've had this dream a couple weeks ago and I just can't shake the magic it holds. It starts where I'm running from these 3 people. I know that they want to hurt me but I'm so caught up in the thrill of the chase that I'm actually enjoying it. They chase me into this open field where I suddenly stop and turn to face them. They are each situated at each of the directions, west east and south, and I'm standing at north. It's strange but I know it's the winter solstice. I look at each of them calling them my brothers and sisters and show them their tribes in the stars clustered above their heads. I tell the one that he is Mayan the other that he is Cherokee and the third that he is Incan, and that I myself am native American Indian. From there I turn back on my path and carry on running without them chasing me, and that is where my wolf starts running with me along my path. The strange thing is I'm very English blonde haired blue eyed South African, yet I feel I have ties with these people. ~I had a dream that I walked into a forest and I saw a wolf pup going down a stream. I picked it up and it talked to me so I put it back and picked it up again. When there was another so I got it when a large figure that I knew was a spirit transformed into a glowing white wolf. I felt trusted so I took the pups home and when I did the forest moved closer and I could see all the way to the other side. When I went to go see it rained really hard and where I was it snowed so I went home and it was around my house, but not in the yard. When I looked I saw a cloud with lava flowing out. Then I saw the wolf come and it was in its white wolf form. ~I have had the same dream for 7 days, it is a black wolf. I am the black wolf and I walk in the woods. I stop and look at my paw print. I keep on walking, then I get killed by something or someone with a Native American arrow with a wired sibowl. I looked it up it means the full moon and a war wolf, and then when I am dead I moan and stare at the moon and the moon turns orange. Now I'm having psychic visions from this wolf or me and I think it's my past life! ~I had an unusually vivid dream. I was in a clearing and I knew that the woods were at my back. There was snow on the ground. two wolf pups came bounding out of the woods at me. Instinctively, I knew they were my friends. One wolf pup was white with shining blue eyes, that was a female. The other wolf pup was black with beautiful deep brown eyes, who was male. Somehow, I knew they were brother and sister. The three of us played together for a while, running through the snow. At one point, I had even laid down in the snow and the two of them laid next to me, on either side. That dream took place about a year ago, and I have only seen the pups since then, but I can feel that they are present. ~I had a dream last night where I was in a field and I heard rustling in a patch of long grass. I turned to see a wolf staring at me with blue, sea deep, eyes. she barked at me, and somehow I understood what she meant, Follow Me. I followed her, and we were in this just big, open place, with buildings, very few that I recognized. I look to my left, only to see this Huge, Black, wave or something come straight at us! The wolf took me on her back and ran. As we we're running I asked her what was happening, she replied an oil spill, but she didn't know where. She told me she was sent to protect and help me. The wave had crashed by now and disappeared. We we're back in the field. Talking. She was speaking in yips and barks but somehow I understood her. She said I had to tell someone about this. I responded who would believe an oil spill is going to happen in real life but me? She looked sad, but then uttered a name, Rachel, a friend's mom and disappeared. I see the wolf regularly also. I'm 14. ~I had a dream that I saw a black wolf with a long neck and yellow eyes. It was like looking in a mirror, it was sitting right in front of me. Eye-to-eye contact, then I noticed it was me. I think it was my spirit guide saying that I'm a wolf in a man's body. I am of Native American descent and I'm related to a lot of Blackfoot Native Americans. I am also African American. ~The dreams that I have are very interesting. Most of the time the wolves are watching me and walking in the background, but I can feel them. In some of my dreams when there is a person who I know, they always turn into a wolf. There are different kinds of wolves. Some are dark purple almost black and have blue eyes and were almost like wolves that looked intimidating but were really nice and peaceful. I also saw three wolves who were standing in the dark and watching me. Two had brown eyes and one had blue eyes. In the dream with the dark purple wolf, I transformed into a wolf. I was white and with a little grey on my back and face, with bright blue cat-like eyes. About a week ago we were driving to school, I was being driven to school by my mom and there was a wolf on the side of the road sitting and watching me in the car, it was exactly like the one I turned into. I am a 13 year old in Vermont and I just want to find out what the wolves mean. ~I was in a red Honda, somewhere deep in the forest with two friends. I look out the window and to my amazement I see a huge whitish grey wolf, but it retreats back to the forest when I spot it. Then, a pack of abnormally big, white-grey wolves emerge from the forest in single line. I close the car door but they do not charge, instead, they surround the car, walking around it in circles. Then, I notice an Indian walking along with them. I look back at the magnificent wolves, and that's when I look into one's eyes. They were beautiful, so memorizing. It was like looking at Niagara Falls for the first time and I felt like I was looking into the universe. Its eyes were like a ring of bright green light around its pupils. I couldn't cut my gas. All of a sudden, the car begins to disintegrate but I was only paying attention to the wolves. Everything around me begins to turn white and beautiful. I begin to float, and that's when I wake up. ~I was 14 when this happened but here I was in the middle of a field and there was this fog. In the fog I heard a great war. I was in a old war world II uniform and this white wolf just comes out of nowhere and for some reason I had this urge to follow it, and when I did I came into this open building on a steel beam. The wolf was on the other side waiting for me. As I looked down I had seen running water so I crossed the beam and the wolf attacked me. Then it stopped, looked at me then jumped. I talked to a Wiccan and he said that my spirit animal had sacrificed itself in order to protect me. ~In my dream I was in the forest and I saw a lot of wolves. They were watching me and their leader walked up to me and he turned me into a beautiful white wolf pup. I lived with them in their wolf pack. ~Late one night, while working on my computer I began to dose off. I was studying what a familiar spirit was when suddenly a white arctic wolf was looking at me. I shrugged it off, but 2 weeks later I was dosing off again and saw the wolf again, He remained there looking at me longer. This time I could not dismiss it.